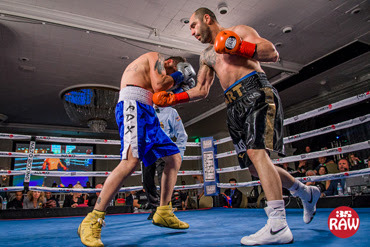 Valley Fight Night witnessed the return to action of former 140lb contender Art “Lionheart” Hovhannisyan (18-4-3, 10KOs). Originally scheduled to face Carlos Villa (12-3) before a fight week injury by Villa, the Lionheart scored an easy 1st round TKO over replacement opponent Francisco Medel (12-12, 8KOs). Medel, of Tuson by way of Mexico, had nothing to offer his opponent and was floored 3 times with body shots before a stoppage was signaled. The 36 year-old Hovhannisyan, who came out of retirement after going winless in 4 bouts against Top 10 ranked competition, looked brilliant in the beginning of his comeback towards the world rankings. In the co-main event, the Valley’s own Jessy Martinez (9-0, 5KOs) from Tarzana scored an easier then expected stoppage over San Francisco’s Richard Hargraves (3-2-2). Martinez showed patience in figuring out his foe, who had recently held another 8-0 fighter Flavio Rodriguez to a draw. But this time, it was all Martinez, as he dropped and stopped Hargarves in the 3rd with a right hand to the temple. Hargraves rose but referee Wayne Hedgepeth stopped the fight, as the fighter’s legs were very unsteady. First, John “Joe Louis” Ward of Los Angeles (who has a striking resemblance to the Brown Bomber) made his debut a successful one, stopping crowd favorite Alberto Leyva, of Duarte, CA in the first round. Ward showed jitters early, but opened up with big shots to drop his awkward foe with a barrage of punches that were punctuated by a big left hook. Leyva got up and gamely fought back, but was taking punishment along the ropes when the referee stopped it. Leyva, who had a highlight reel knockout in his Valley Fight Night debut last November, falls to 1-1. Then, undefeated welterweight Ronnie Biggers was shockingly upset by unheralded, Rodolfo Gamez. Southpaw Biggers, of Fontana, had staggered and dropped Gamez his over the course of the first two rounds. Then in the 3rd round, Gamez decked Biggers with a big right hand. Gamez’s follow up barrage dropped Biggers again and he could not beat the count. Gamez, of Tucson, improves to 2-4, while Biggers falls to 3-1. In other undercard action, Gardena’s Steven Pichardo scored a wide 4 round decision over UFC and Bellator MMA veteran Estevan Payan. Payan kept up the pressure, but was being outlanded in the clean shots department by the taller, slicker fighter. Pichardo moves to 3-1 while Payan falls to 1-4 as a boxer. Vlad “Superbad” Panin of Los Angeles, by way of Belarus, stopped San Marcos’s Jonathan Espino in round 3. Espino found a home for the left hook, but it was too sporadic an offense, as Panin dictated pace throughout. In the 3rd round, Panin scored the KO with a beautiful right hand counter. Espino fell flat on his back, and although he rose, the referee had seen enough. Panin moves to 2-0, while Espino drops to 1-2. In the opener, undefeated featherweight Robert Ochoa, of Los Angeles, won a 4th round TKO over veteran Jesse Adame of San Bernardino. Ochoa looked to be having an early night after dropping Adame early in round 1 only 15 seconds in. However, Adame hung in there and fought through blood and a barrage of punches, until referee Wayne Hedgpeth decided he’d had enough at 58 seconds of round 4. Ochoa improves to 4-0 with 3 knockouts. Darts, PDC get rid of walk-on Girls – should boxing get rid of ring girls?